Danmark er allerede mere "grøn" end mest lande, men regeringen har en plan at blive "grønnere". Faktisk, har de en plan at blive 100% grøn i 2050. Kan et land egentlig være fuldstændig uafhængig af kul, gas, og olie? Anders Fogh Rasmussen, Danmarks præmiere minister, siger "JA!" Denmark is already "greener" than most countries, but the government has a plan to become even "greener". In fact, they have a plan to become 100% green by 2050. Can a country actually completely independent of coal, gas and oil? Anders Fogh Rasmussen, Denmark's prime minister says, "YES!" Jeg har talt mange gang om vindmøllerne i Danmark, men hver dag, lærer jeg mere og mere om hvordan vind energi kan blive brugt, og det er forbløffende for mig! For eksampel--Vi har mange små byer i Danmark hvor kun tre vindmøller skaffer hele bys elektricitet. Vi eskportere vindmøller energi til Norge fordi vi kan ikke bruge alt det vi skaffer. Vi har en kontrakt med DONG Energy at skabe biler med batterier lavet af energi fra vindmøller. Og nu, vores Præmiere Minister vil have os til at skaffe nok vind-energi til at opretholdet et hele land! HVOR SPÆNDT! I have talked many times about the windmills in Denmark, but every day, I am learning more and more about how wind energy can be used, and it is amazing to me! 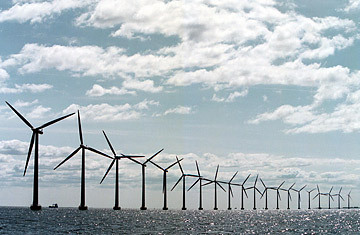 For example--We have many small towns in Denmark where only 3 windmills produce the whole town's electricity. We export windmill energy to Norway because we cannot use all that we produce. We have a contract with DONG Energy to create cars with wind-powered batteries. And now, our Prime Minister wants us to produce enough wind energy to sustain the whole country! HOW EXCITING! Er det muligt? Det tror jeg. Fordi vi allerede har et eksampel på en af Danmarks ø, Samsø. I mindre end ti år, har SAMSØ, en dansk ø i Kattegat, blevet 100% "grøn". Samsø har en befolkning ca. 4300 som arbejede sammen at skabe et miljø hvor de er 100% selvstændig igennem deres vind energi. Faktisk, skaffer de mere energi end de kan bruge! En mand som bor på Samsø har en vindmølle, som 22 meter høj hvilket skaffer mere energi end hans familie kan bruge, så han bruger den ekstra energi på at varme hans vand. Så hvis Samsø kan få det til at ske med 4300 indbygger, tror Anders Fogh Rasmussen og jeg at Danmark kan gøre det samme med 5.5 million indbygger! Is it possible? I think so! Because we already have an example on one of Denmark's islands, SAMSØ,. In less than ten years, Samsø, an island in the Kattegat Sea, has become 100% green. Samsø has a population of about 4300 people who worked together to create an environment where they are 100% self-sufficient through their production of wind energy. In fact, they produce more energy than they can use! One man who lives on Samsø has a windmill that is 72 feet tall which produces more energy than his family can use, so he uses the extra to heat their water. So if Samsø can make this happen with 4300 people, Anders Fogh Rasmussen, AND I, think that Denmark can with its 5.5 million residents! That's amazing and inspiring. I really hope that Sweden gets its act together and starts investing in wind and solar power instead of gas and nuclear power! I wonder why they don't build those in North America? We need to be greener! There's videos from NBC, CBS etc. NBC also visited a wind farm in Texas. Wish we could look into the future at 2050 and see what Denmark looks like. Wow thats incredible. I love the work Denmark is doing to save the environment. Makes me really proud to be here too. You know, living in Denmark is what inspired me to be more earth-friendly! I really enjoyed reusing shopping bags, taking coke and beer bottles back to the store for the refund, and I realized how clean a country could be just by recycling and becoming aware of what you are throwing away. So now I recycle and reuse everything I can. Sounds like a grand plan! America is so busy denying that we actually have problems, instead of trying to solve them. I hope our new President will make that a priority. It is much more doable with 5.5 million people than ?? 100 million - not sure how many people reside in the US. Ms Norgaard - I'm sure you know that #. See you soon! 1 more day and we are headed across the big sea. Kelli, thanks for your advice on my residency application. Did you submit your part in English or in Danish? Skønt at høre at du synes om alternativ energi, det er min store hobby sammen med min familie. It's so cool to see that a whole country can be so progressive and forward thinking. Sometimes it seems like the only time people are willing to invest in greener solutions is when the traditional methods start becoming too expensive. Not much foresight or acting in a preventative manner. Over the last 25 years, Denmark’s economy has grown by around 75% - with nearly stable energy consumption. Never underestimate the power of DONG. This site is great! I'm going to set a link from my page to connect to your page you have some great information about Samsø!I just wrote about this great island on my blog. Hope you guys check it out at www.traveldenmark.weebly.com!